The symmetric light distribution from the floodlight allows precise application beam control, maximising useful light. The functional task separation of the lighting circuits provides the correct lighting levels with no excess lighting on unused areas. A high quality lighting design allied to the precise optical control from the luminaire minimises spill light onto adjacent areas, reducing energy use by using light efficiently. L'Hippodrome de Lyon "Carré de Soie" is a new regional racecourse in Lyon, France. 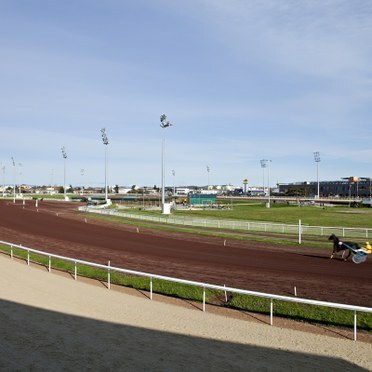 An exciting and welcomed arrival on the horseracing scene, it includes two tracks, including one for jump/flatracing (1,425m) and one for harness racing (1,200m). Technical performance was a key requirement for the lighting scheme, with national and international lighting standards to be met, and many of the races televised on French equestrian TV channel, Equidia. 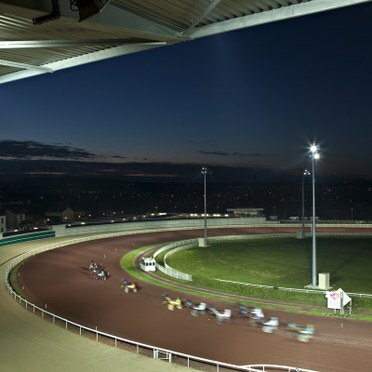 Aside from high performance task lighting, minimal light spill was essential because of the racecourse's proximity to an urban residential area.Working alongside lighting installers, Bouygues Energie Services and Citeos, Thorn was chosen to design and supply the lighting on the basis of its ability to provide complex, globally recognised technical solutions with a strong regional team. For the tracks, the high power and performance Mundial R (2KW- HF) floodlight was chosen. Designed for sporting applications, it features a circular reflector with symmetric distribution to concentrate the flux and in turn achieve a very good utilisation factor with less light spill and reduced glare. As well as low obtrusive light, Mundial R also offers excellent photometrical performance to enable high definition TV diffusion. The event area has been fitted with the Champion (2KW) discharge floodlight. Champion offers advanced optical control, incorporating the "flat emissive area" concept and an integrated visor to reduce glare and obtrusive light. High optical efficiency and accurate light distribution also further reduce light spill. The result is a state-of-the-art racecourse lit to the highest specification. The staff at Les Hippodromes de Lyon are extremely satisfied with the result.